I was pleased and also a bit worried when a watchmaker friend let me know that he was about to service an Ulysse Nardin GMT perpetual for the first time and that he was going to take a lot of pictures to document the process. I was pleased because I think the GMT is probably the most sophisticated perpetual calendar on the market today as the indications can be easily be advanced in both directions by merely turning the crown. Friends who own the watch also describe it as the most user-friendly of all two-timezone watches as the local time can be set with the two pushers at 4 and 8. 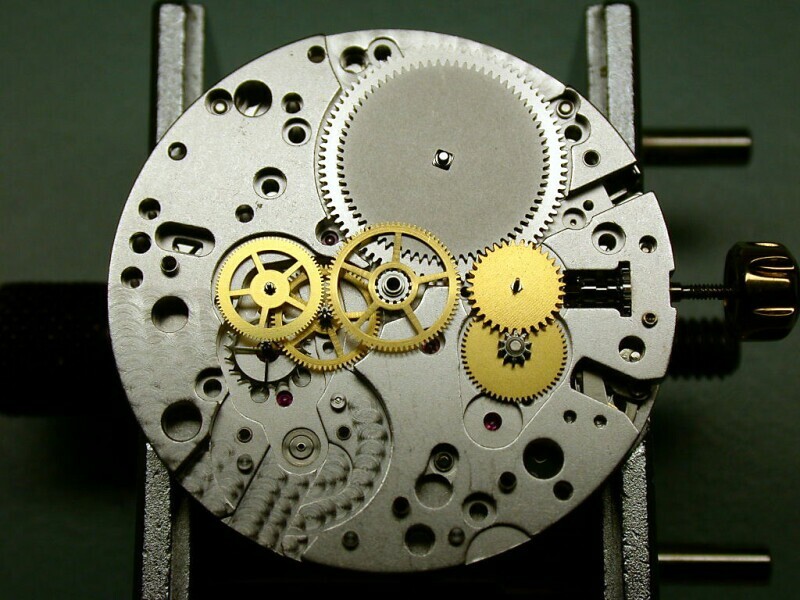 And I was also a little bit worried because I knew that even a very experienced repairman would have to overcome some high obstacles when servicing a watch of this complexity for the first time. Fortunately such worries were completely unfounded, the watch has been cleaned, oiled and reassembled without any mysterious parts having been left behind and is running like new again. The author of this article prefers to remain in the background, any comments or questions can be sent to me and I’ll forward them to him. Let’s take a peek inside the genius of Dr. Ludwig Oechslin. Specifically, let’s peek inside a product of his very creative mind, the GMT+- Perpetual Limited Edition. This watch uses the Lemania chronograph Caliber 1352 as its base movement. 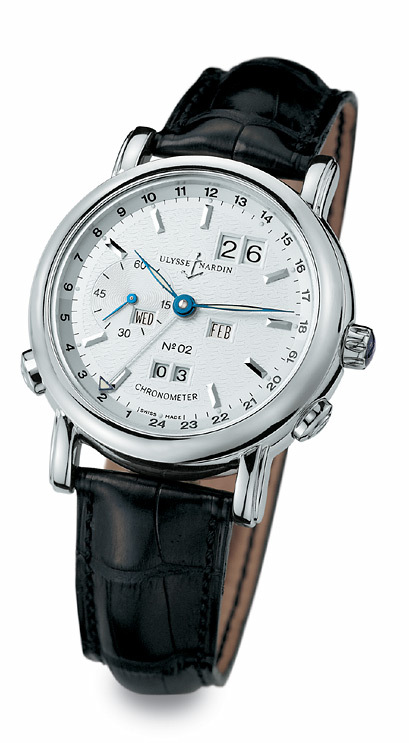 I think that the main reason for this choice and not Ulysse Nardin’s usual one, the ETA Cal. 2892, is probably due to the large diameter of the module fitted to it. The Lemania Cal. 1352 is actually a refinement of their older Cal. 1340/1341. The main differences being a thinner and more simplified automatic winding section and some additional refinements to the dial side to bring the overall thickness down from 8.2mm to 6.5mm. Casing diameter remains unchanged at 31mm. For those unfamiliar with the Cal. 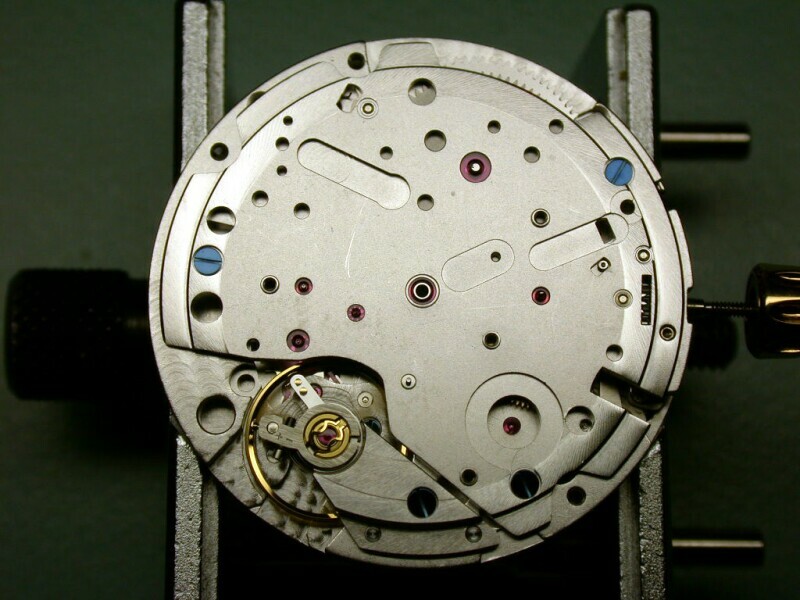 1340/1341, Omega used this movement for a short time in their Speedmaster line in the 1970’s as Cal. 1045. Here is the going train and barrel, together with the two wheels that accomplish both hand and auto winding. With the upper bridge in place, one can see the cut-outs for the chrono parts, which are not used in this model. The dial side ready for the module to be fitted on to it. The wheel left of center is the driving wheel for the perpetual module. This wheel is driven by the hour wheel which has the 12 notches internally in order that the hour hand can be advanced or retarded in one hour increments. The steel disc with the 12 notches on top of the hour wheel, together with the pushers and their extensions, accomplishes this. Here one can see the underneath of the module. 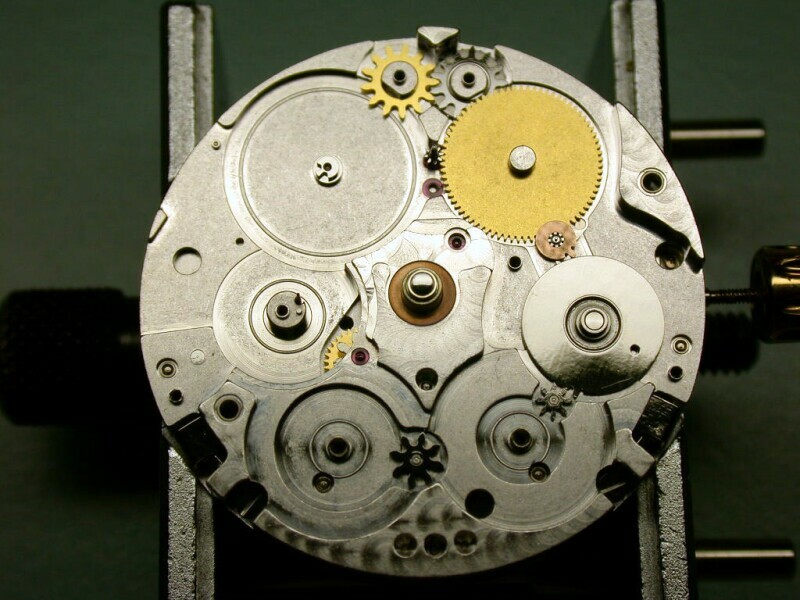 The wheel in the center is for the 24 hour hand with the pusher extensions and their spring just below it. The interconnected wheels on the left hand side are the quickset wheels for programming the module. The cover not only holds the pusher extensions in place, but also provide the lower supporting jewel for the barrel arbor. 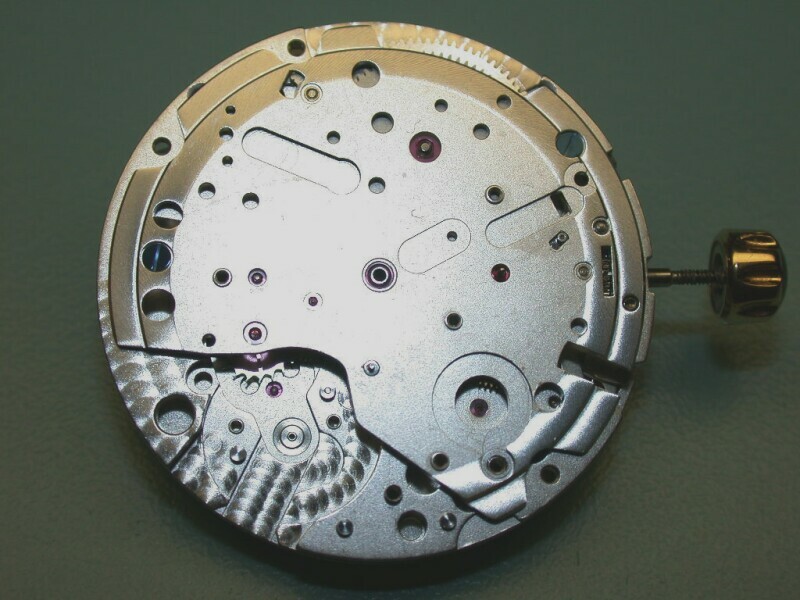 The lower plate of the module fitted to the movement. 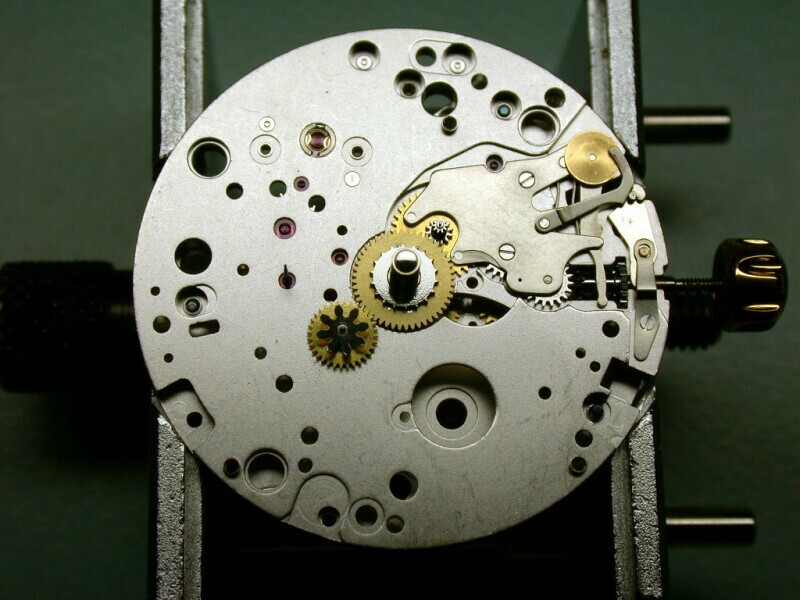 From this picture one can see that the module is not really watchmaker friendly for servicing. Why? Due to the fact that the screw close to the top jewel and slightly right of center can only be accessed by dismantling most of the module. Most perpetual modules can be fitted and removed as a complete unit. This one and the Patek Philippe do not permit that due to their construction. 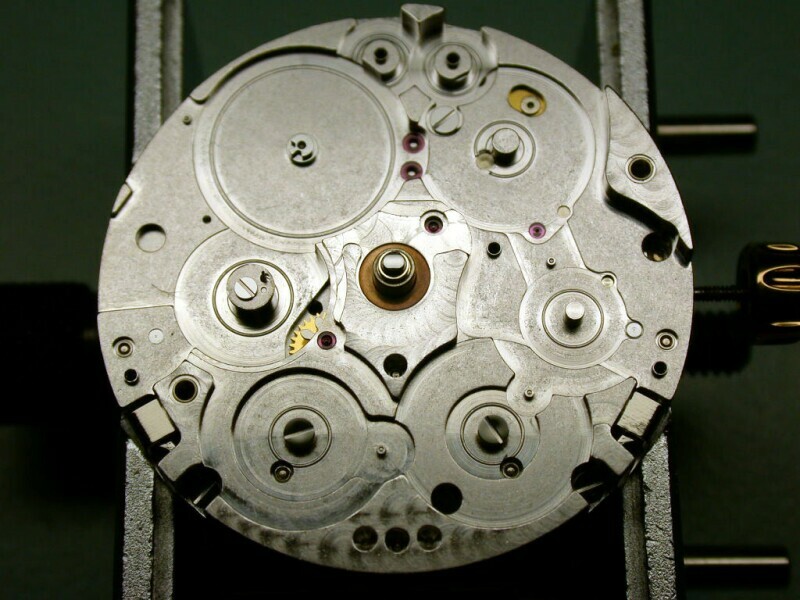 Watches that permit the module to be removed as a complete unit, without disassembly, are easier for the watchmaker to service. There is no difference as far as the user is concerned. 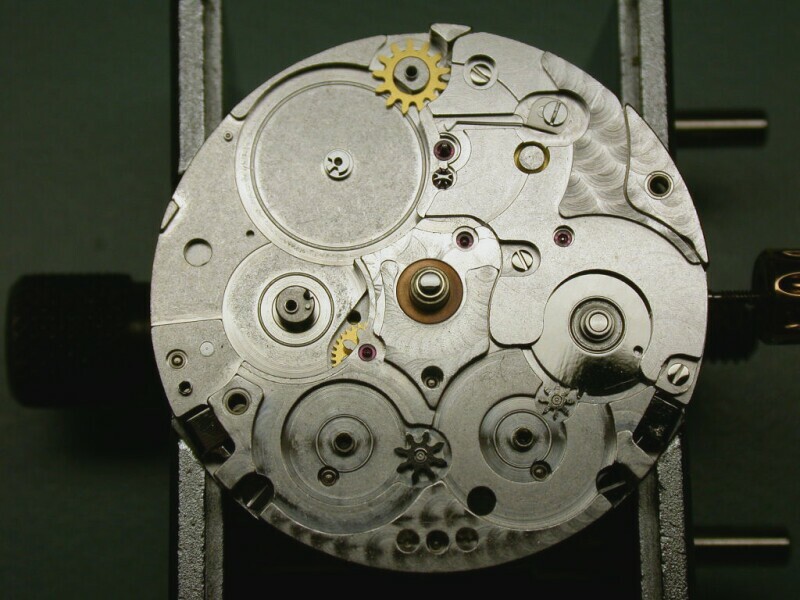 The complete movement, sans the automatic winding. 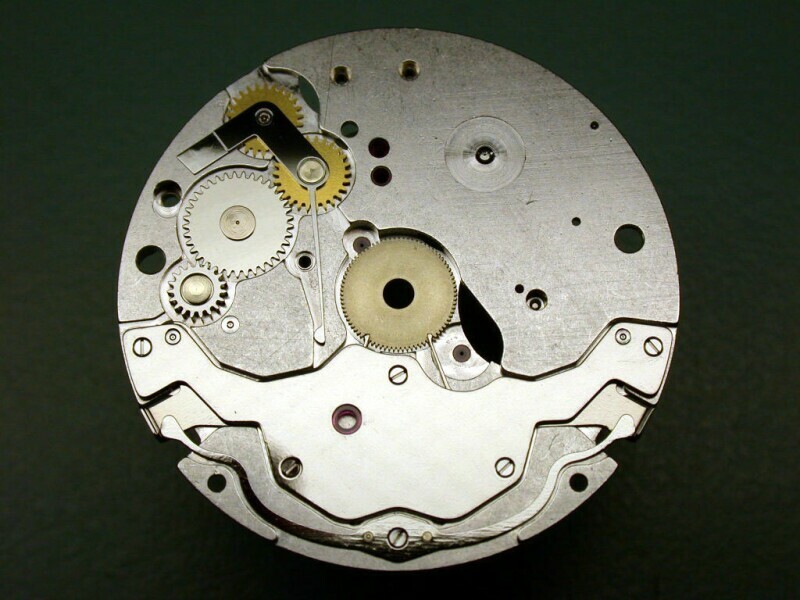 Note that the automatic winding is not a module like the ETA Cal. 2892. The steel wheel on the right has the month indicator attached to it. Here one can see it together with its driving wheels. The small brass wheel with one tooth adjacent to it makes one revolution per month. Each revolution of this wheel advances the month wheel by one month. The steel month wheel also has one large tooth – that’s December – to advance the year by one digit for each revolution that it makes, as it changes from December to January. Here with that sections top plate in place. 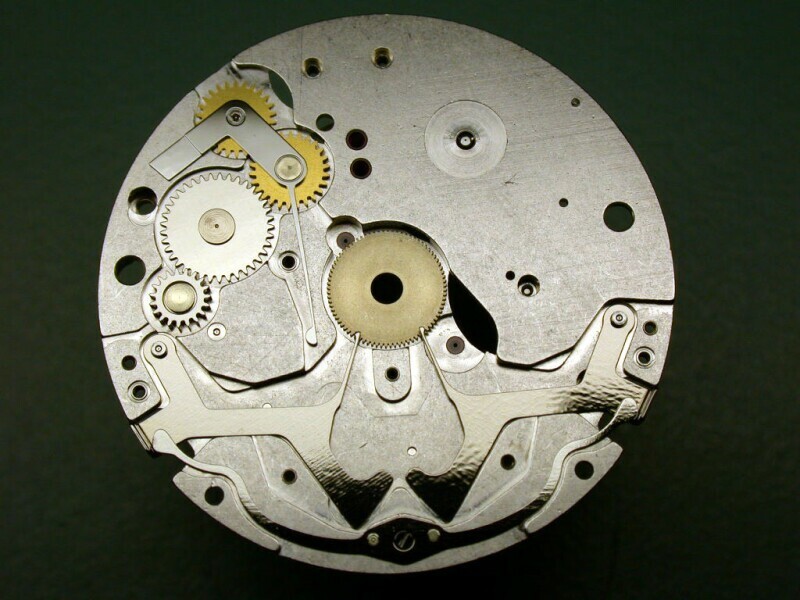 The two steel pinions near the top at the 12 O’clock position are for the date (lower one) and decade (top one).